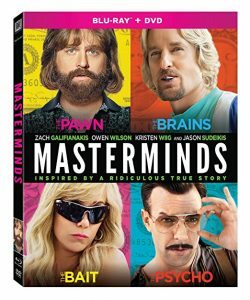 Zach Galifianakis is armed and dangerously funny in this hilarious action-comedy inspired by an incredible but true story! David (Galifianakis) is an unassuming armored-truck driver who longs for adventure. Lured into the scheme of a lifetime by his beautiful work crush Kelly (Kristen Wiig) and her cohort Steve (Owen Wilson), David manages the impossible and makes off with $17 million in cash. But when his partners-in-crime keep the loot and set him up for a fall, David must dodge the authorities, evade a hitman (Jason Sudeikis) and find a way to take back what he rightfully stole!